Reality: new churches can collect troublemakers from area churches, but they don’t have to. One of the legitimate fears and questions from fellow pastors that are thinking about leading a group through the church planting or replanting process is how do you deal with all of the people that you collect that have left all the other churches? After all, won’t a new church just rally all of these trouble makers into one place?! The single biggest tool you have to prevent a hostile takeover of your thriving new church is the same vision and direction from God that brought you there in the first place. Teach vision! Then teach it again! When people visited our new church early on, they knew very quickly what we were about and where we were going. Those that agreed, stayed. Those that came for power or pet projects or with axes to grind moved on rather quickly. For example, it was made known that one of our first guests would not return unless I agreed to use a different Bible translation. I lovingly communicated the reality that if he did not like this aspect, it was likely that he would not like many of the other ways we “did church” as well. He moved on without incident or anger. Be sure to make this vision contagious within your core group, as well, from the very beginning. The bigger the team, the harder it will be for a wolf in sheep’s clothing to launch a successful attack (Ephesians 4:14-15 and Matthew 7:15-17). When a new politician is elected, they often justify their actions by saying that they were elected with a mandate to enact the policies that they campaigned on. This concept can help the church planter as well. The sending church or network can offer the undervalued role of insulating the leadership of the new church from vision-hijacking power grabs and the ever present “good ideas” that will lead you away from the God-given mission. This is never more important than when confronting individuals that have a reputation for causing problems elsewhere. In effect, the planter or replanter can fall back on the mandate that they set out to accomplish in the first place. Sometimes it is hard to tell a well-meaning attendee no when they come to you with activity after activity that they want to see in the church. This is especially true when you are desperate for attendees in the first place (See blog article: “Motivated not Desperate” for more on this topic). A strong leader should be able to gently communicate the original vision to the individual and why their idea does or does not fit within that framework. If the vision is strong, they will will see this and trust your leadership. A good leader will not blame a sending church as an excuse for not acting on someone’s good ideas, but an effective leader can and should communicate that they were sent out on this mission with certain expectations and a particular calling. 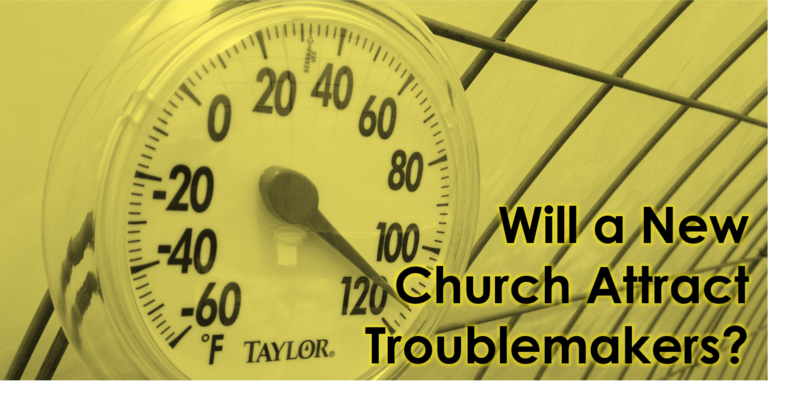 If structured well, the sending church or network can offer enough supporting accountability and external leadership to insure that the replanting pastor cannot get fired by troublemakers in the early days of change as well. This offers them the ability to make the bold changes necessary to bring the replanted church back to its original mission in contrast to simply being seen as the newly hired pastor. The final reality is that someone who may have been perceived as a troublemaker somewhere else may be genuinely seeking a community of believers where they can belong. One of our best couples came with a phone call from a former pastor along with several mundane warnings that made me only like them better. In fact, I probably would have gotten the same notes if I had left that church since they were based on methods of teaching that I use often. Be open minded enough with every guest that you allow them the same courtesy that Jesus gave us: the freedom to start over. Remember, the same desire to see a living and vibrant church that pushed many of us out into the unknown world of church planting and replanting would garner us the title of troublemaker in a lot of congregations too. If in doubt, wait a bit. As the scripture teaches, you will know true disciples by their fruit. The two words that describe a healthy application of this principle are (1) discernment and (2) forgiveness. Practically speaking, we make joining the church very different than moving into a leadership position. Joining requires signing an agreement that covers our statement of faith, the member’s salvation experience, and a few other details. Leadership comes from observation and dialogue over a period of time to make sure that only like-minded people that share the vision join the team. Some “church people” have caught the same vision that you have and are really seeking a new place to grow and be an active part of the kingdom. Do not exclude them simply based on reputation. They can play a vital role in serving the new community of believers in your new work. But hold strong to the vision God gave you in the beginning, and make sure that He is the only one that can change it along the way. Troublemakers will always find those trying to follow Jesus. Rather than being surprised, prepare yourself and those you are discipling to meet them head on with a full dose of prayer, contagious vision, discernment, and forgiveness. Then allow the Holy Spirit to either move them along to another church or change their hearts. Whatever you do, do not let the fear of gathering a few negative church hoppers keep you from following God’s call on your life!